Chardin's studies of kitchen utensils fall roughly into the years 1728-34; before that, he concentrated on still life with game. He may have turned to kitchen subjects on his admission to the Academy in 1728 to distinguish himself from artists such as Desportes and Oudrey who specialised in game and hunting pieces. 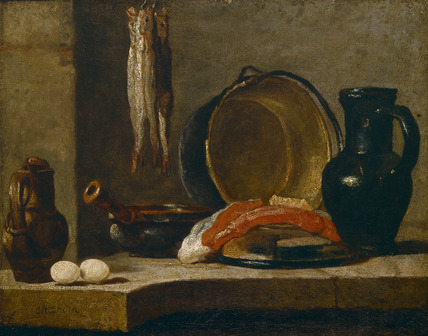 This work was probably painted c. 1733-34 when Chardin was turning to genre scenes. Two other versions are known.